Frets Nirvana is a musician in Second Life best known for the benefits he helps organize at Veterans' Isle every month. Just before the concert in May, I had a chance to interview him and ask him a few questions. 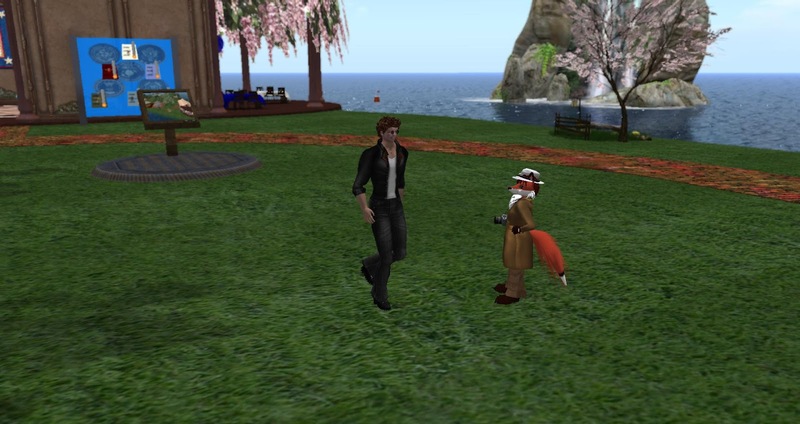 Bixyl Shuftan: "So how did you find out about Second Life?" Frets Nirvana: "Through a former employee and friend, Von Johin. 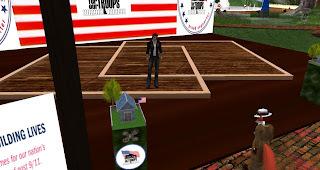 He was performing in SL, told me about it and helped me get started." Bixyl Shuftan: "So you had a friend performing here? What did he tell you about it?" Frets Nirvana: "He basically said it was fun and you could actually make money performing (at that time! Ha-ha!) Anyhow, he had not heard me play before although he had worked for me. When he heard me play ... he said they would love what I do musically in SL ... and encouraged me to perform in SL." "That was about five years ago now ..... Due to real-life he is no longer performing in SL, but he used to a lot." Bixyl Shuftan: "How did your first few days go here?" Frets Nirvana: "Well the first performance was great. I performed at his venue and he helped promote it. We had sixty people that night. After that his manager helped promote me and I was off and running ......playing a lot of covers with my own arrangements of other people's tunes." Bixyl Shuftan: "Sixty people, that's pretty good." Frets Nirvana: "Yeah ...Von was pretty well established at that time, so it helped. After that though ...it was a lot of hard work, and a bit of a struggle. I was not singing at that time ...just doing all instrumental. So it was a harder sell." Bixyl Shuftan: "About what point did you include singing?" Frets Nirvana: "I also tried doing a duo with a female singer. That was going well ... unitl (laughter) she bumped me and went on her own. Kind of the story of my musical life with singers." Bixyl Shuftan: "Oops, what happened after that?" Frets Nirvana: "I strated singing about six months after I entered Second Life. I had never sang lead vocal before ...just backup. But I figured out that I needed to sing if I was to have more success in SL, and well ... I just jumped in and worked on it and went for it. (laughter) Hopefully not offending anyone. Along with my guitar playing it is something that I have worked on a good bit. Although I will probably never be a love song singer." "Kind of like everything for me in life ....I just make a decision that I am going to go for something, and work hard at it and do it." Bixyl Shuftan: "What did audiences think at first?" Frets Nirvana: "Well ...(laughter) nobody left due to singing to my knowledge. And they seemed to like it, and my crowd and bookings grew ... so guess it was a good decision." Frets Nirvana: "But of course ...guitar picking has always been the feature." Bixyl Shuftan nods, "when did the idea first come to you about doing bennefit events for veterans?" Frets Nirvana: "That idea came about the same time ... about six months after starting performing in Second Life. I saw all the activity forRelay for Life, and some other causes, and thought 'gee, why not for vets?' If not for them we could not be doing any kind of benefit for other causes .... or for that matter Second Life ... huh, trying living in Syria or Iran!" "So, I took the initiative, and started it. Take note,I am not a vet. I just feel strongly about what they do and how they sacrifice, and how they should be supported. ESPECIALLY in today's world. Bixyl Shuftan nods again, "How did the veterans respond to your idea?" Frets Nirvana: "Well, once I figured out who to get in contact with, they responded well and jumped right in. 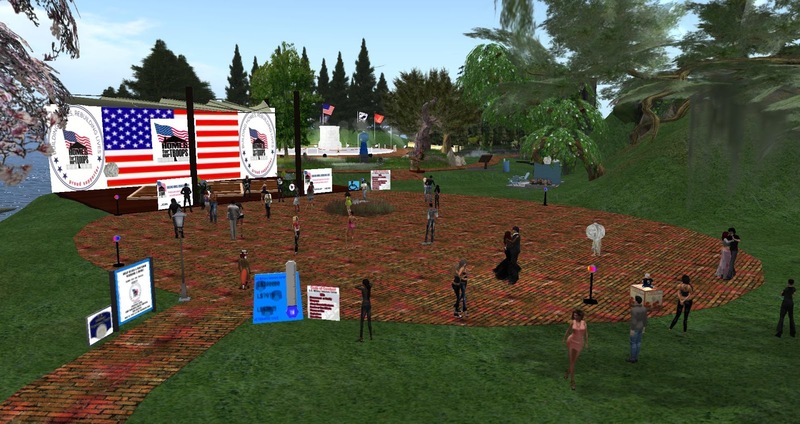 Some of the original people involved are no longer in SL much, but it has kept on going. Dahlea Milena is a BIG part of that at this time. She has been sooo helpful and supportive." 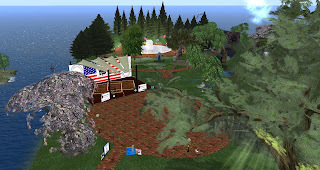 Bixyl Shuftan nods, "I recall the events were first at Patriot Island for Wounded Warriors"
Frets Nirvana: "In general though ....it all had to picked up by the bootstraps at first of course .... And yes, until last fall, all were for Wounde Warriors Project. I switched allegiance to Homes For Our Troops at that time. one main reason, lack of support by WWP. I won't go into that any further. They still do good work but HFOT is much more supportive and I feel that the percentage of dollars that actually help Vets is higher with HFOT." Bixyl Shuftan: "What was the most successful of these events?" Frets Nirvana: "Mmmm ,,,, well it is really hard to say on that. It varies really, and so far I have not really found a definite 'this is the best.' 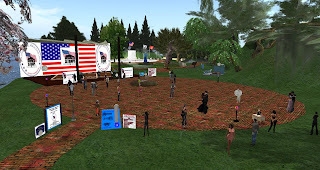 But I can say this soemtimes we have raised as much as 300,000 Linden for vets in one month. I keep trying to keep the trend going up." Bixyl Shuftan nods, "I wasn't familiar with Homes For Our Troops before. Where did you hear about them?" Frets Nirvana: "I found HFOT on the web. I was searching for an organization that would be more supportive, and I talked to a lot of them. Amazingly, many did not want to get involved, and I have some theories on that (government!). But HFOT jumped right in and said yes." "I hope we can honor that support with soem excellent donations going to HFOT. They do great work." Bixyl Shuftan: "Sounds great. 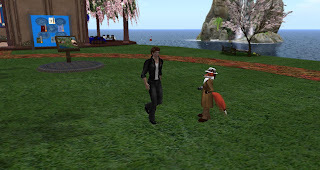 Did they have someone who was familiar with Second Life?" Frets Nirvana: "No, they were not familiar with Second Life. I had to educate them on it. But they were open right away to hearing about it. Others seemed to resist. ""We have sent over $45000 to help veterans through WWP and HFOT in the last five years." Bixyl Shuftan: "Forty-five thousand dollars, that's pretty impressive." Bixyl Shuftan: "Heh heh ... Have any of the veterans made an effort to involve another charity?" Frets Nirvana: "Yet ... on an aside, Relay for Life states they $250,0000 in one year, so why not for vets? Not that RFL is not a good cause." "Not aware of vets trying for another charity. But if they do,good for them. But I know what I went through getting this set up, a lot of work." 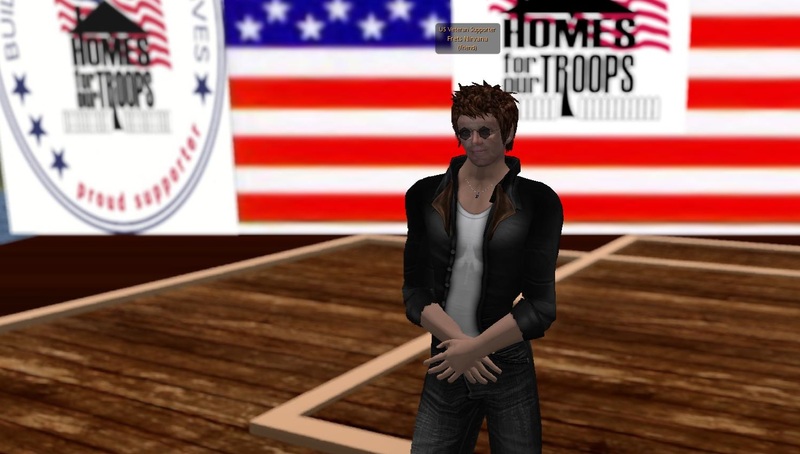 Bixyl Shuftan: "What other benefits for veterans in Second Life have you heard of?" Frets Nirvana: "Well ....I haven't really ...."
Bixyl Shuftan: "Just one time performances and nothing else on a regular basis?" Frets Nirvana: "Usually .... Since I have been involved in this for some time now, if someone wants to do something for vets they will contact me, and I give them donation kiosks etc. .... there are others who do benefits, but they will use our donation kiosks etc." "So if that is what you mean, there are venues here and there that do things, but not on a regular basis like our monthly benefit. But I WELCOME that big time. Our vets need all the help we can get. RFL does not, collects $250,000 with one benefit! (laughter) But I don't have the time to organize what they do." Bixyl Shuftan nods, "Besides the charity events, can you tell me what else goes on at Veterans Isle?" Frets Nirvana: "As far as Veteran's Isle .... candidly you would have to talk with Dahlea about that." Bixyl Shuftan nods, "Did you have any plans for special events soon?" Frets Nirvana: "Well, we have one event a month that I organize,last Sunday each month. That is about all the time that I have to be able to organize an event. But I definitely welcome anyone who wants to put something together for HFOT. ... this months benefit, May 31. Then the next one will be June 28 .... etc. Always last Sunday of each month from 5-9 PM at Veteran's Isle. That way we have at least one benefit, and hopefully establish a schedule that people put on their calendar." Bixyl Shuftan nods, "Were there any venues that you performed at which had benefits of their own? Frets Nirvana: "Not on a regular basis .... thinking about it, I cannot highlight any that I perform at that have benefits for vets. But I would welcome that." Bixyl Shuftan checks the time, "Was there anything else that you wanted to mention?" Frets Nirvana: "Just that I encourage people to take the time out of their busy lives and think about the needs of our wounded veterans ....and help as they can. And if anyone wants to sponsor an event for HFOT, contact me." Bixyl Shuftan: "Thank you for your time and good luck." It was then that we parted ways. Shortly afterward, Frets messaged me about one more detail, "Here are a couple more names that have been very supportive. Jardasius Ecksol, Checkers Firelight and Vicktoreeia Resident. They are the primary ones that come to mind that sponsor events other than our monthly benefit. They do a lot with motorcycle clubs in Second Life. If you do mention other people, please make sure to mention them." Shortly after this interview, the May 31st benefit on Veterans Isle took place. It was a success, raising 200,000 Lindens. Frets is still doing well at what he does. The next fundraiser there is Sunday June 28. Before then, he can be found performing at a few venues across the Grid.